The adoption of a directly-elected mayor in West Yorkshire as a condition of more devolved powers is an unwanted, but necessary step. The idea of elected mayors was rejected by voters in Leeds, Bradford, Kirklees and Wakefield during a 2012 referendum and local officials from the Conservative and Labour parties have both expressed their reservations. Coun Peter Box, Labour leader of Wakefield Council and chair of the West Yorkshire Combined Authority, said: “With 95 per cent of decisions that affect our citizens being taken outside our local areas, the case for devolution is unarguable. Coun Keith Wakefield, the former Labour leader of Leeds City Council, said it was clear that we must re-open the debate in West Yorkshire as to whether we want a directly-elected mayor. He said: “We thought we had answered this conclusively with a referendum on an elected mayor in 2012, but now we are back to looking at it again. “We need to know what is on offered from government, but equally we are going to have to speak to the people and businesses in Leeds and see if they have changed their minds. Coun Tim Swift, Labour group leader on Calderdale Council, said he was concerned that the will of local people will be ignored if an elected mayor is installed. He said the idea that a single authority figure is better than a group of decision-makers is a myth and pointed to a recent case in Tower Hamlets, London, where its elected mayor was convicted for corruption. He said: “There are also real practical issues in how a single mayoral figure would relate to an area like Leeds and West Yorkshire, an economic area that is not simply dominated by one city but actually contains three cities and a host of proudly independent towns and communities. “On the other hand, the benefits of much greater local control over spending and decisions, even in the constrained form, the Government is granting Greater Manchester, are very real. “Some difficult choices lie ahead,” he added. 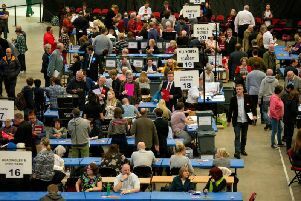 Coun David Sheard, Labour leader of Kirklees Council, questioned whether there was an appitite among the public for another level of elections and that the elected mayor model is “too narrow”. .